For only $10.oo you can get this great gift of chocolates customized with your name and/or logo presented in a clear acrylic box. These chocolate squares are individually wrapped and printed with your custom design. 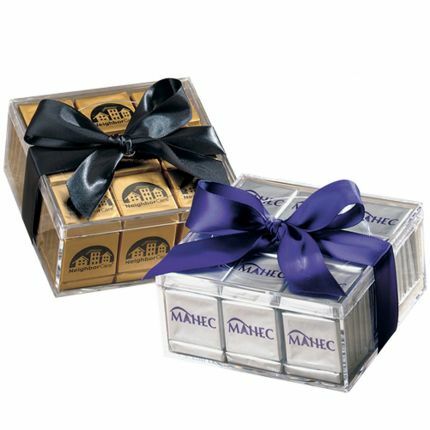 Acrylic gift box with imprintable 7/8″ ribbon holds 100 chocolate squares. Perfect for those that like individually wrapped foods at at an unbelievable price. Thank you for sharing. Dark chocolate is the best.